Online Magic School - Learn Magic, Have Fun & Entertain! And here’s part two where I show you how to perform this simple Sponge Ball magic trick… Go grab a sponge, any type and follow along in this tutorial. Sponge Ball Tutorial from Cartess Ross on Vimeo. 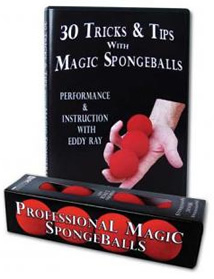 For those of you who wish to learn advanced tricks with magic sponge balls, I’ve included information on a DVD combo pack that comes with sponge balls so you can start practicing right away. Countless magic effects can be performed with these 2 inch red spongeballs! Package includes four 2 inch spongeballs and a 30 Tricks & Tips DVD featuring Eddy Ray. Feel free to leave your comments about this magic trick below after watching! i love it!!!!! sooo greaat!!!!! Magic is an art, so i request all learners to give due respect to this art,and when knew the tricks never overact on it. it was great as usual !!! hey awsome trick im a lefty so its really hard for me to hide the ball in my thumb so plese help me can. BUT GOTTA SAY NICE TRICK.!!!!!!!!!!!!!!!!!!!!!!!!!!!!!!!!!!!!!!!!!!!!!!!!!!!!!! i love it its so cooool!!!! where can u get spongeballs besides online? where is the other trick’s tut ? this is the best 1 ………………………..thanks brooooo!!!!!! How did you do that stuff with the dollar bill? ?